There is always a great demand for things used in everyday life. Whether it is a small item or medium items. Today we are talking about plastic comb business. If you are planning to start your business in manufacturing industry then this is just for you. Today, there is a different kind of combs in the market. If you sell different types of good quality of combs and sell it in the wholesale market, or you sell your own brand of the comb by selling it in retail, then it can be beneficial for you. The information in detail about how this can be done is as follows. The most important raw material used to start this business is Polypropylene, which is a small plastic grain of plastic granules. You will find it in different colors in the market. These plastic grains i.e. polypropylene are made by many companies. Which you can buy and trade by building a comb. These plastic granules are made by PIL, Shriram, Champlast and NOCIL, Reliance etc. You can buy it online by searching on websites like IndiaMart, Plastmart or Alibaba. From here you will get it at a rate of 50 to 100 rupees per kilogram. Apart from this, if you use recycled plastics after making the comb, you can save your money. So you do not have to spend a lot of money on this. This machine will come in between 2 to 10 lakh rupees. The price of the machine depends on the machine's efficiency and its functioning. It comes in between 50,000 to 2 lakh rupees. After comb becomes a buffing, polishing and heat stamping machine is used. You will get all this from Rs 10,000 to Rs 1 lakh. You can use a single hydraulic injection molding machine not only to make the comb, but you can make many types of small plastic items such as buckets, mugs, jugs, plastic toothpicks etc. and so on. Can. You will need different types of a mold for this. Which will help shape different items? You may have to spend up to 5,000 to 50,000 rupees for this. In addition to preparing comb, some small hand tools such as greasing and cooling equipment will also be required, which will be available to you between 10,000 and 30,000 rupees. In addition to all this, testing equipment like Micrometer Balance is also required which will come up to Rs 10,000 to Rs 1 lakh. All these machines can also be purchased by ordering from online websites like IndiaMart, Plastmart or Alibaba. Do not forget to register your business in the industry premise before running any business. You can also register it online via the internet. Apart from this, it is also necessary to get GST registration of your business, for this, you can get help from a chartered accountant, CA of your local area. When you start a business and you use the machine for it, you must have no object certification for it. If you are doing this business in the city then you will have to obtain NOC by registering in the Shop Act License or Municipal / Municipality. And if you are doing this business in the village, then registering that village Panchayat, you have to get NOC from there. 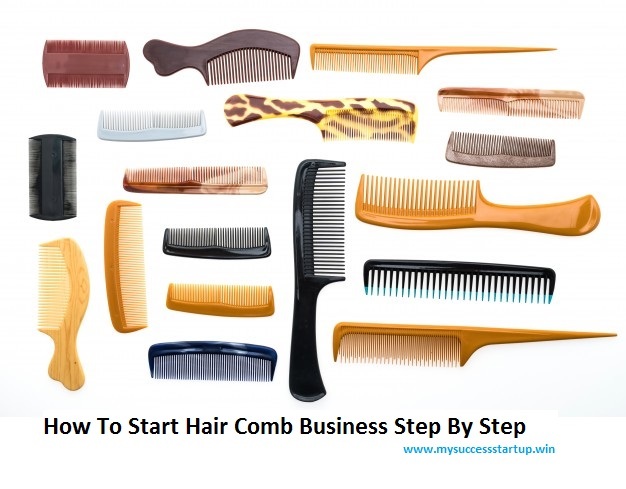 You will need a place to start your business, where you can easily install a combing machine. So you will need at least 2,000 square feet of space for this. In order to establish this business, you can start up to 5 to 6 lakh rupees. Which is mostly the cost of machinery used in it. There will also be a need for some employees to run the machine or packaging the comb, so you have to pay them also. You can borrow a loan from a public or co-operative bank from a financial institution like loan or microfinance for the initial investment. Apart from this, you can also get Government Currency Loans or Khadi Subsidy Loan. Although once you have established a business, after that you only have to invest only for its raw materials and employees' salaries. The comb is constructed on a hydraulic injection molding machine. All information about how it is used will be found from where you buy this machine. The person who sells the machine will also give you full training. So that you can use it well. For this, you will not have to go out of training in any institute outside. Here we have provided some information about the comb through the machine, which can be of use to you. To make comb, you have to first put its raw material polypropylene i.e. in the plastic granules. The machine is equipped with a heater, from which these grains of plastic pass through and melt it. After this, different types of mold are installed in the machine, you are starting the business of comb making, so you can use a variety of comb combinations such as handled comb, big comb, small comb etc. Therefore there are many types of combing mold available in the market. This molten plastic reaches through an injection pipe until the comb's mold attached to it. Then it takes the form of a comb. More than 1 comb is also made in the mold once in a mold, as blocks are made in one mold. After this, there is a cooling process in the machine, which works to cool the hot plastic in the mold. When it gets cooled, then the comb is taken out by opening it. Simultaneously, the comb is finishing, as if some extra plastic is sticking in it, then it is removed with the help of scrap grinder. Once the comb is made, it needs to be polished in order to make it attractive; apart from this, you can also add the name of your brand to the truncated comb. A hot stamping machine is required to brand name on the comb. For this, make a stamp of your brand and fit it in a hot stamping machine and add it to the comb. After completion of this process, it is tested in the last, for which micrometer is used. In this way, the comb can be made very easily with the help of machines.